Signed and dated l.l. corner, red/orange oil "Counihan 44". Professor Joseph Burke, The Sydney Morning Herald , 'Art in Australia', pg. 10, Sydney, 04 Feb 1954, 10. Brian Finemore, Painting , 'Introduction', pg. 4-5, London, 1961, 5, 28 (illus.). Richard Haese, Modern Australian Art , 'Communism and culture, left-wing art in Melbourne and Sydney, 1942-46', chapter 6, New York, 1982, 166 (colour illus. ), 167. Joanna Mendelssohn., The Bulletin with Newsweek , 'Work as art', Sydney, 09 Jul 1991, page unknown. Review of the exhibition 'Noel Counihan: Images of Working Life 1933-1986' touring 1991-1992. Colin Simpson., Sun , 'Art's Angry Penguins on show', Sydney, 02 Jul 1944, unknown. Review of CAS exhibition. Natalie Wilson, Australian art: in the Art Gallery of New South Wales , 'Out of Melbourne: realisms and mythologies', pg. 163-164, Sydney, 2000, 164, 170 (colour illus. ), 300. City art , 'Poverty and the city', Victoria, 1978, 21 (illus. ), 101 (colour illus.). Noel Counihan , Melbourne, 1974, 74 (illus.). Present day art in Australia , Sydney, 1949, 59 (illus.). Bulletin , Sydney, 12 Jul 1944. Review of Sixth Annual CAS exhibition. The Sydney Morning Herald , 'Contemporary artists "insulted"', Sydney, 29 Jun 1944, 4. Review of CAS exhibition. History of emotions: Annual report 2016 , 2016, cover (colour illus.). In our own image: the story of Australian art , Sydney, 2002, 124 (colour illus.). Federation: Australian art and society 1901-2001 , Canberra, 2000, 116 (colour illus. ), 256. The human face of the Great Depression , 'How to manufacture Communists', pg. 171-182, Mornington, 1997, front cover (colour illus. ), 182, back cover. Achieving Full Employment , South Yarra, 1994, cover (illus.). AGNSW Collections , 'From Colonialism to late Modernism', pg. 7-106, Sydney, 1994, 56, 57 (colour illus.). Noel Counihan: Artist and revolutionary , Melbourne, 1993, 187-88, 504-05. 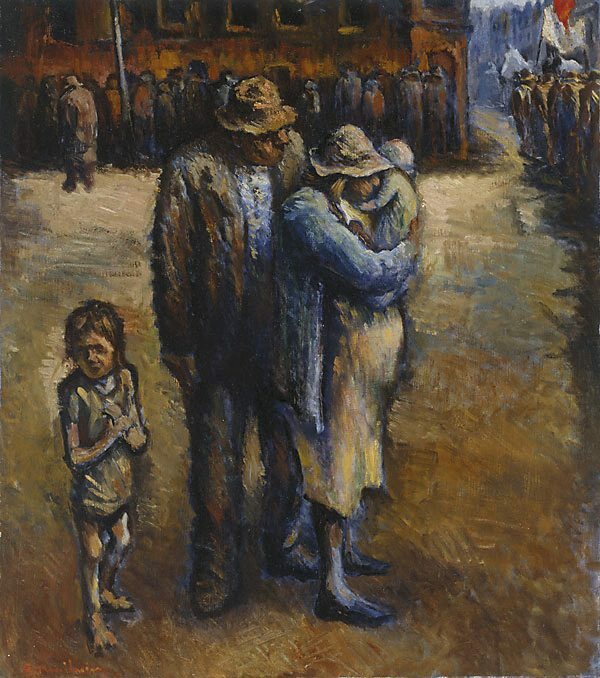 Australian Modern Painting Between the Wars 1914-1939 , 'The Depression', pg. 126-137, Sydney, 1989, 137. Noel Counihan , Kenthurst, 1986, 11-12, 14 (colour illus. ).